What are the best chainsaw safety chaps and trousers to use? In many countries, the forestry or logging industry has extremely high death and injury rates when compared to other workforces. This makes sense given trees are being felled and a lot can go wrong, both accidental and user effort with dangerous machinery. Now think back to the good old days when chainsaws began to gain widespread use in the logging industry. Did those crude saws feature safety innovations such as chain brakes? They sure didn't and many users were maimed and killed as a result. If that was bad enough, think of their safety gear. No chain safe safety chaps were issued by employers 80 years ago. Instead, hungry & honed blades cut through denim work jeans into bone and arteries without a care in the world. In the present, the modern chainsaw user has a much safer gig when chopping down a tree however they must take precautions and using properly designed safety chaps is a great way to prevent harm to your legs. It doesn't matter if you are a forestry worker or an experienced weekend warrior, using safety gear should be a standard part of your chainsaw practice. Let's not waste your time. 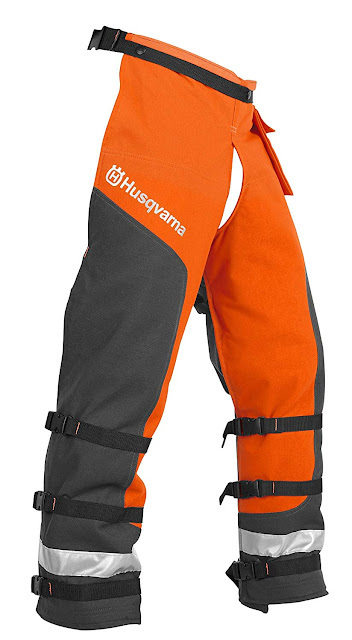 If you just want to know which is a great pair of chaps then the Husqvarna protective wrap chaps are quite suitable for most users. The real question you might want to ask yourself is do they work? Here's a picture an Amazon buyer left in his review. He described the situation as that he: "Put a running saw to my left leg while limbing some cedars. Strands stopped the saw and didn't even have a bruise." How do safety chaps protect legs from a chainsaw blade? Let's be upfront, safety chaps are not a suit of armour. If you wanted absolute protection from a chainsaw, then you may as well suit up like a Knight. However, that's not too practical when chopping wood, so chaps offer the versatility of movement with the knowledge they are designed to reduce the severity of the cut should an accident occur. What we are saying here is there a tradeoff between practicality and safety here. If the idea is safety, then placing a user in cut-retardant chaps that are too restrictive or that become too hot in itself is unsafe so many internationals safety standards for chaps and personal protective safety wear recognize this. When a chainsaw comes into contact with the safety trousers, the outer layer is immediately cut through by the blade but the inner layer of fibres (such as kevlar) are drawn out by the chain and into the machine. It wraps around the saw's drive sprocket. The tough fibres lock the sprocket in place thus halting the chain and hopefully limit damage to the chainsaw operator's leg. That said the stronger the chainsaw, the more chance of damage can occur to the user. It also depends on how fast the saw is going, the strength and angle of the saw. Does it matter what kind of chaps to wear if I am a casual or a professional user? If you are simply doing a bit or yard work or lopping the occasional branch off a tree, it might not make economic sense in buying the best professional pants there are. You may simply decide to use something that will help keep you safe but is perfectly functional for your needs. At a minimum though, the pants should still be designed to meet a suitable product safety standard. "First day of sawing, running a bigger saw than I had used in the past, tired and neglectful that it idled down slowly - saw pivoted in my L hand as I reached for a branch with my R hand, and I felt a "bang" on my left thigh and the saw was suddenly quiet. I looked down and had crossed the blade onto my leg - the blade was now stuffed with white strands from the chaps, and I was unscathed. Saved me from my very own trip to the ER and allowed me to cut another day"
If you don't feel like getting your quads cut, then check out the price on Amazon. Just be wary of buying pants which are designed only to protect from flying debris / keeping your work pants clean. These are not designed in any way to protect your long limbs from a chainsaw bar cutting into your leg. They are only good for keeping the grass off. What if I really only want budget pants? There are a few protective pants out there that are handy for those on a budget. Remember, you should only wear pants which are designed specifically for use with a chainsaw and thus should have been fully tested to comply with the relevant safety standards. 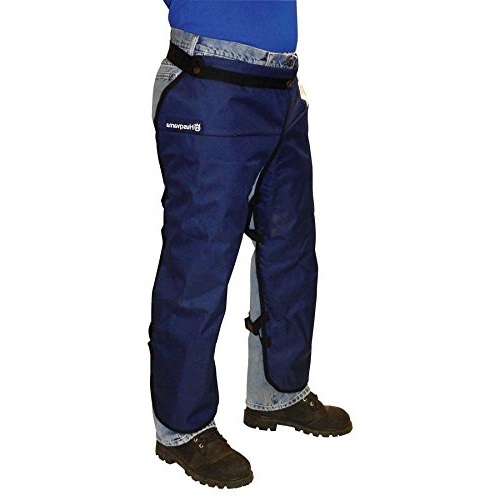 For the cost-conscious, the Forester range of apron chaps might be the ideal choice. We hate to use the word 'casual' but for those that only use a chainsaw every so often, then these chaps could be ideal. They provide good coverage for the front of your legs. The only drawback is they are not designed to protect against the really high powered saws and they certainly won't halt an electric engine from rotating. They are do however meet the STM F1897, OSHA 1910.266 standards and are UL Certified. We suggest if your day job requires chaps, then you go upmarket, such as the Husqvarna 587160704 Technical Apron Wrap Chap . Buying safety gear gives the user the confidence that it will do what is asked of it t - i.e. reduce the chance of severe leg injury. In terms of aesthetics, Forester describes them as "sleek, durable, lightweight, and comfortable chaps are chainsaw oil- and water-resistant". The chaps also feature a large side pocket and a flip adjustment belt for a perfectly secure fit. Again, we always ask - do they work? "I needed to drop about 8-10 small trees and just out of habit put these on. That day it was the smartest thing I did because not only did they save my legs from injury once but twice the same day. First time I just cradled the chainsaw on my leg and had not set the brake, the chaps stopped the chain from cutting into my thigh right where I bend. I surely would have bled out before EMS got to me." The wearer is uninjured which is a great result because that cutting area is pretty damn close to the femoral artery. Which, you may know is a pretty major one and a severe cut can result in a bleed out. If you think protecting your femoral artery might be a good idea, then check out the price on Amazon. Is it true electric chainsaws will cut through even the best chaps? Yes, this is true as they are not configured the same as gas powered saws. As they have higher torque than gas engines, electric saws will continue to cut the chap fabric and chaps are generally not designed to withstand contact with an electric saw. Sure, you should still wear chaps when using an electric saw but do not rely on them to reduce the chance of personal injury. What length should chainsaw chaps be? Chaps (which go over trousers and legs) should be long enough to cover the tops of your boots. To figure out how long your chaps need to be, measure from your waist (just below your belt where the chaps will sit) to the beginning of your foot. This length will provide suitable coverage and protection. When ordering chaps it's important to understand that the advertised length is the overall length and not the length of a traditional measurement of the inseam. When you're thinking about buying safety gear, whether it be chaps, gloves or protective eyewear, it's always really good to remember that no one ever died just because they bought quality gear. Actually, we think the adage is no one ever regretted buying quality but you get the point. I know we keep talking about it, whatever buying decision you make, you really should consider if your safety gear has met the requirements of the most relevant safety standard. Your femoral artery might just thank you for it. If you've got this far, well done. Now, head to Amazon and have a look at the best safety chaps they have.